We sell quality TV Brackets and wall mount Brackets for your television. Whether you have a plasma TV, flatscreen TV or LCD TV, we have the mounting solution for you! With today’s slimline flat screen televisions taking up less room in our homes, more and more people are mounting them to their walls by using TV wall brackets. When you use wall brackets for TV sets to hang your television, you minimise the clutter that occurs when you use a clunky television stand that takes up valuable floor space. Television wall brackets come in many styles and price ranges so that almost every lcd as well as other types of slim televisions can be catered for. There are three main types of TV wall mounting brackets. Each provides different benefits depending on your differing needs such as the angle you want to view your television from. Flat screen TV wall brackets can be affixed close to the wall. These are useful for rooms with limited space as the television is almost flat against the wall. There are cheap TV brackets, yet they are made to a very high quality. One of the downsides of these television brackets is the lack of manoeuvrability. Once the television is fixed to the wall, it cannot be angled to suit your changing viewing needs. This is ideal for those with fixed viewing positions. Whatever television you have, you will find the right bracket in our huge range of lcd TV brackets, whether you need a TV bracket that moves or one that is stationary. If you require more manoeuvrability from your lcd TV brackets, tilting TV brackets may be more suitable. These TV brackets are one of the more common types of wall brackets for your TV. With these brackets you can tilt the television so that you can find the best viewing angle without having to move furniture. While these TV wall brackets provide the ability to tilt your television, they do not allow for horizontal swivelling, but no need to worry, we have a big range of different cheap TV wall brackets available. Full motion TV brackets are not always cheap TV wall brackets, but they do provide the viewer with a much wider range of motion than the other two types of TV mounting brackets. This type of lcd TV wall bracket is ideal for those rooms with multiple viewing areas, such as kitchens and integrated kitchen and living rooms. You can easily swivel the TV so that you can view it while preparing food, while sitting at the kitchen table or while relaxing in the main family area. These wall mounted TV brackets provide the best ease of use, but are more expensive than the other two types of flat screen TV brackets. They also require two or more people to install as they can be more difficult to install than the other types of TV wall brackets. Choosing the right lcd TV wall bracket can be difficult due to the wide range of types and styles. As more televisions come in different colours and styles, it is necessary to find matching TV mounting brackets. 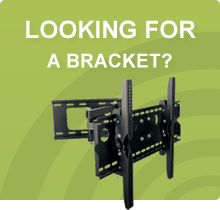 It is best to choose a bracket that matches the style and design of your television. We provide excellent and thorough customer service that can help you to choose the lcd TV bracket that is right for you and your room. Contact us to make the first step to ordering and installing your new lcd TV wall bracket. We can also help you to decide on the best location for the new wall brackets for your TV. We know the market is competitive, that is why we offer you high quality wall mounted TV brackets for the lowest of prices. By buying your cheap TV wall brackets through our website, you know you will be paying for the very best of quality, so you can find cheap TV brackets to suit your every viewing requirement. Buy those new TV wall mounting brackets today so that you can start enjoying your lcd television in style.